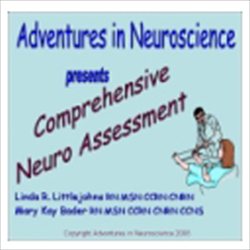 The Comprehensive Neuro Assessment DVD, from Adventures in Neuroscience, presents an assessment of neuro patients across the continuum of the lifespan. This comprehensive DVD includes actual case studies and assessment chapters such as the purpose of the exam, level of consciousness, assessment scales, pupils, cranial nerve exam, motor and sensory exam, coordination and gait, reflexes, pediatric patient exam, and differential exam/case studies. Building on the foundation of anatomy, a sound knowledge of normal and abnormal findings during assessment can facilitate early recognition of potential problems and make a difference in the outcome of a patient. This DVD offers a comprehensive review of the normal function in addition to deficits seen in a variety of neurological diagnoses. We will review and demonstrate assessment techniques across the lifespan, including all five areas of the neurological examination.